Dried specimens need to be re-hydrated with Relaxing Fluid. You receive a supply of crystals to dissolve in water. The resulting fluid inhibits mould and relaxes the specimens in the relaxing box, ready for setting. 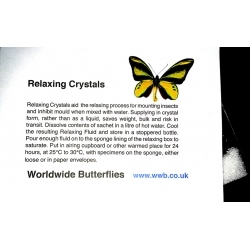 The crystals are sufficient to make at least a litre of Relaxing Fluid.